Nobody won or lost their division with the moves they made over the past 10 days, but there were teams that very clearly improved, as well as teams that declined into the margins. And for those teams with holes left on the roster, there’s still some talent left for the taking. Before we get to the best of who’s left, though, let’s break down the winners and losers from free agency’s dying days. When it comes to managing their roster, the Saints abide by a best-player-available philosophy. In 2007, they picked Robert Meachem, despite already having a talented core of wide receivers. Meachem’s become a valuable contributor, finishing in the top five in DVOA (Defense-adjusted Value Over Average) in each of his two seasons as a starter. In free agency this year, the same approach landed New Orleans the second-best player on the market, Aubrayo Franklin. It’s still a total mystery why the 3-4 teams of the league didn’t make a move to sign Franklin, whom Patrick Willis “prayed to God” the Niners would keep for his ability to occupy offensive linemen and create havoc at the line of scrimmage. While financial terms for Franklin’s one-year deal haven’t been disclosed, anything short of eight figures would be a good deal for the Saints. Franklin’s probably a better fit in the 3-4 than he will be in the 4-3 alignment that the Saints play, but New Orleans just got one of the 30 best defensive players in football with essentially no risk attached. While the Saints bought low on Franklin, the Jaguars were buying high on one of their own players, tight end Marcedes Lewis. Jacksonville gave $18 million in guaranteed money to Lewis, who already had the franchise tag and about $7.3 million committed to him for the 2011 season. They’ll likely point to the 10 touchdowns Lewis had last season and talk him up as a red zone threat in the mold of Wesley Walls, but we’re talking about a guy who had seven total touchdowns through his first four seasons in the league. From 1983 through 2009, there were 17 instances when a tight end scored 10 or more touchdowns in a given season. Only once did that tight end repeat the feat in the subsequent season (Antonio Gates in 2004 and 2005). If you want to argue that Lewis’ double-digit touchdowns signify a trend and not an outlier, consider that that Lewis went from an average of 11.1 yards per catch during his first three seasons as a pro to 16.2 yards per catch in 2009. It was only the seventh time since 1983 that a tight end had averaged 16 or more yards per catch in a 30-catch season. None of the other tight ends had been able to keep their receiving average that high. Lewis was no exception, as he fell down to 12.1 yards per catch in 2010. He is a decent starter at tight end, but Jacksonville’s paying for a star when all the numbers indicate that what they’re going to get is a downswing back towards league-average. Detroit made a nice move in picking up Stephen Tulloch on the cheap on July 31. They’ve continued to shop effectively at the bottom of the market since. We wrote about Jerome Harrison as an undervalued player in our free-agent preview. The Lions added him to back up Jahvid Best on a one-year deal. You normally look for a backup who complements the strengths and weaknesses of your starter, but Harrison really does everything well. Teams have repeatedly passed on Harrison because of his slight 5-foot-9 frame, but the Lions are clearly comfortable with shorter backs, having drafted the 5-foot-10 Best to start. If Best gets hurt, don’t be surprised if Harrison produces as a full-time starter. Combine his numbers over the past two years and you get a line of 265 carries, 1,192 rushing yards, and six touchdowns. The Lions also got a massive upgrade at safety by signing former Giants starter Michael Johnson to replace C.C. Brown. Johnson had to cover for Brown’s mistakes in New York in 2009 before getting hurt last year, but he’s versatile enough to contribute at either free safety or strong safety and is just 27. He should fit in at strong safety next to budding star Louis Delmas, who will be at free safety. It’s a good thing Bill Belichick is who he is, because if Al Davis or Daniel Snyder made the moves he’s made, they’d end up becoming embarrassing trending topics on Twitter. After inexplicably cutting defensive end Ty Warren at the end of July, the Patriots went shopping for a defensive line that would have been football’s best in 2005. The trade for Albert Haynesworth was one thing, but they’ve also brought in defensive ends Mark Anderson, Shaun Ellis, and Andre Carter, none of whom looked particularly effective last year. The Ellis signing, in particular, is exactly the sort of thing that the Raiders would do: Go out and acquire a player because he had a great playoff game against you. While it’s always hard to quantify the statistical impact of a 3-4 defensive end because his job is usually to simply occupy blockers, the Jets weren’t willing to give Ellis much more than the veteran’s minimum, even after their aborted approach for Nnamdi Asomugha. That’s telling. Carter had 11 sacks in 2009, but he struggled when the Redskins moved to a 3-4 last season. At 32, he could very well be finished. Anderson never developed after a 12-sack rookie season, and once offensive linemen figured out what he was doing to get those sacks, he never adjusted. He’s also too small to serve as anything beyond a situational pass-rusher, which the Bears discovered before cutting him last season. New England is reportedly making these moves as part of a switch to a 4-3 defensive alignment, which doesn’t make much sense when you consider that its best defenders — nose tackle Vince Wilfork and linebacker Jerod Mayo — would be marginalized in the 4-3. The Patriots signed Wilfork to a five-year, $40 million deal in 2010, so it’s strange that they’re not building their defense around his strengths. He excels at holding up blockers at the line of scrimmage and isn’t the sort of penetrating, one-gap force on the interior that the 4-3 usually demands. The Eagles continued to buffer an already strong defensive front by signing utility lineman Anthony Hargrove away from the Saints. At 270 pounds, Hargrove might be a tweener in the Eagles’ scheme — too big for defensive end, too small for defensive tackle — but the Eagles should be able to use him next to Cullen Jenkins as a situational pass-rusher on passing downs. He doesn’t have the name recognition of guys like Anderson or Carter, but since he’s still only 28, he’s likely to be better than either of them in 2011. Even better was the decision to sign right tackle Ryan Harris, who was one of the league’s best pass protectors on the right side in 2008 and 2009 before going through assorted injury issues. If he’s healthy, Harris would be a huge upgrade in protecting Michael Vick’s blind side. The Chiefs put themselves in a bad spot with Tamba Hali. They could have re-signed him to a modest deal after the 2009 season, when Hali created umpteen pass pressures on a bad team. Hali accrued only 8.5 sacks that year, which would have allowed the Chiefs to get him under contract for a reasonable deal of about $15 million guaranteed. Instead, they waited for Hali’s breakout season, saw him put up 14.5 sacks, and paid $30 million in guaranteed money. At $15 million, you tend to notice the little things Hali does well. At $30 million, you remember that he was successfully blocked out of a play on an end around by Jason Campbell last season. Read that again. That’s a $30 million outside linebacker getting blocked by a pretty sleepy quarterback. Kansas City, for whatever reason, then added safety Sabby Piscitelli, who might be the worst player in football. If Piscitelli just ends up as a special teamer, it’s a bad move. If he sees even a single defensive snap, well, the Chiefs should reconsider this whole Haley/Pioli thing. Ending on a high note, let’s congratulate NFL general managers for figuring out how wide receivers work. After the Jets gave the high-upside Santonio Holmes a huge contract, the other teams in the running for Holmes could have gone out and justified giving $10 million or so in guaranteed money to one of the lesser receivers on the market, each of whom had major flaws. (“It’s just half of what Holmes got!”) Instead, teams didn’t overvalue second receivers like James Jones and Malcom Floyd because they played in great offenses, forcing Jones and Floyd to head back to those great offenses on midlevel deals. Even more impressive, the league collectively decided that Braylon Edwards is just a famous football player as opposed to one who is actually good at his craft. He ended up going to the Niners on a very reasonable deal: One year for $1 million, with another $2.5 million included if Edwards catches 90 passes and makes the Pro Bowl. This belongs on one of those baseball lists that make fun of David Ortiz or some other DH having a Gold Glove incentive in their contract. Mainly because Edwards has about as good a chance at winning a Gold Glove as he does at hitting the 90-catch incentive. Good job, guys! Even Marty Hurney gets a thumbs-up for this one. If your team still has a hole or two left on its roster, fret not! There are still some talented players available. Granted, many of them are fat, old, injured, or all three, but limited reps and an exercise bike can go a long way into getting them healthy for the regular season. Even if it’s in a reserve role, we’ve found 10 guys who can help at least one football team during the 2011 season. 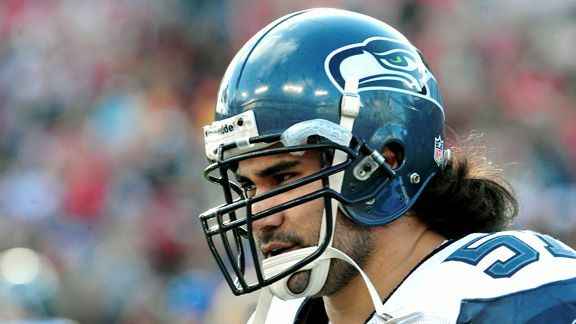 Maybe Tatupu peaked at 25 and is washed up at 28. The tape suggests that he was a much slower player last season. On the other hand, Tatupu underwent surgery on both knees in January, suggesting that he might have been playing through injuries. Since they’ve signed everyone else and intend to start rookie fourth-rounder Casey Matthews at middle linebacker, why not the Eagles? Another middle linebacker who served as a perennial starter on bad defenses (most recently the Jaguars), it’s a surprise that Morrison hasn’t attracted more interest. He might get squeezed because he’s played virtually his entire career in the middle, but he’s overqualified to be a backup for anyone playing a 4-3. The former Greg White has served as a situational pass-rusher and occasional starting defensive end on some bad Buccaneers defenses. Blame Piscitelli, not him. The only problem is that he only made it to the active roster at 28, so he’s hitting free agency at 32. Some team could get five sacks out of him as its primary defensive end off the bench without committing much more than the veteran’s minimum. McKinnie made it to the Pro Bowl in 2009 only to be sent home for partying too much during the week. He was inconsistent in both 2009 and 2010, and when he showed up to camp weighing nearly 400 pounds this month, the Vikings cut him for fear that his cholesterol level was too high for him to play. (Seriously.) He complained about it to TMZ, of all places, which was kind/naive enough to list him at 335. If he’s been humbled into getting into something resembling game shape, he could still be an above-average pass protector at left tackle. Henderson was expected to start at left tackle for the Raiders last year but moved to the right side so that rookie Jared Veldheer could take over. Expected to compete for the right tackle job this year, Henderson also showed up to camp out of shape and had his contract offer revoked by the Raiders. If he can get closer towards a pro body, he’d be a worthwhile option as a swing tackle. Ndukwe was a promising safety on the Bengals before suffering a series of injuries, including a torn MCL last season. He might need to start the year on the Physically Unable to Perform (PUP) list and miss the first six games, but if he got healthy, Ndukwe would be one of the league’s best backup safeties. Nary a peep has been heard about Portis, who was hoping to move into a complementary role in one of the league’s elite offenses. Although running back jobs are hard to come by, some team should make space for one of the league’s best pass protectors, even in a very limited role. If not, we hope that Portis has a permanent job acting too cool for Eastern Motors commercials. He’s a fat guy who will clog up running lanes. There is not much more to it than that. Oh: He might be suspended four games as a result of the StarCaps trial. But he’s a big, old guy who will stand in the way of blockers. That’s valuable! At 47.5, Cole is believed to have the largest Body Mass Index (BMI) in league history. He’s shaped like the cube from Tetris, but Cole is a decent run-blocker who gets lost in pass protection. He’s also capable of filling in at either guard or center. Smith revealed himself to be a pretty bad quarterback for the 49ers last year. Fair. But his old team, the Ravens, are a Joe Flacco injury away from starting Tyrod Taylor at quarterback. This would work out well for everyone involved.